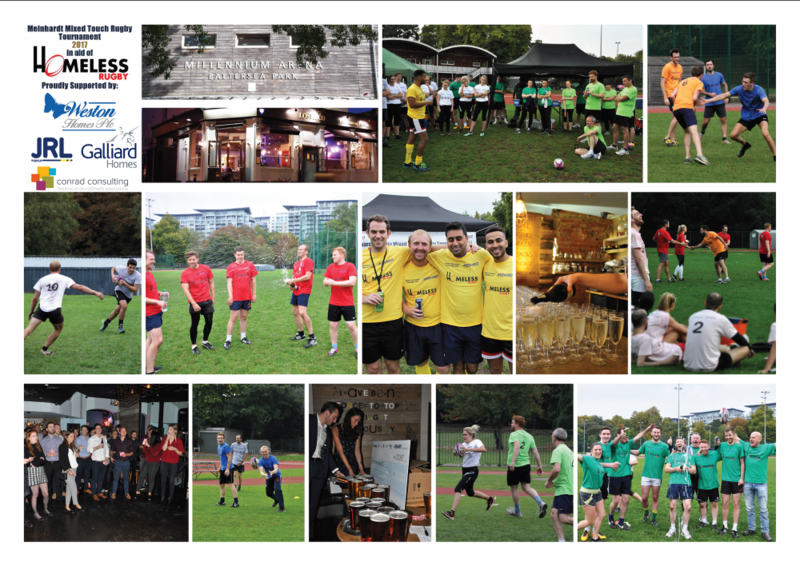 Meinhardt UK held its annual corporate touch rugby tournament & after-party on Wednesday 27th September, raising funds for Homeless Rugby CIC, a charity that tackles homelessness through sport. Meinhardt UK were once again delighted to host the tournament, which consisted of eight competing corporate teams from the property & construction sector. The teams made generous donations to the charity in order to enter their team for the tournament and attend the evening celebrations. We were very grateful to have the support of key sponsors, Weston Homes, Galliard Homes, JRL Group & Conrad Consulting whose backing had a significant impact on the money raised. The tournament took place at the Millennium Arena in Battersea Park in luckily perfect weather conditions. Hard-fought, the tournament cup was won overall by Main Contractor 8build, with Modebest coming a close second to win the plate. The evening celebrations followed at nearby Lost & Co., Battersea, where the charity founder, Darran Martin, introduced the charity, its vital work and the impact our donations have, and presented the tournament trophies to the winning teams. The charity raffle – including prizes such as a Samsung tablet, a Fortnum & Mason hamper, Harlequins tickets and a signed Tottenham Hotspurs team shirt – and some last minute donations from guests brought the final total to a staggering £6,295, drawn up on the giant cheque awarded to Darran. Guests enjoyed the buffet dinner, drinks and live music by the fantastic covers band, Soul Street, who played late into the night. Darran and Patrick Hayes, who is Head of Civil & Structures at Meinhardt and one of the directors of Homeless Rugby, were thrilled with the money raised. “Following last year’s first fundraiser with Meinhardt we were able to launch a new team in Wales as well as host the Homeless Rugby International Cup at Sixways Stadium. The money raised this year will help go towards creating new Homeless Rugby teams across the UK, partnering new charities and clubs where there is a demand to create positive social opportunities for those affected by homelessness,” Darran explains. Homeless Rugby & Meinhardt have a donation page still up and running until the end of October. And to Sparkling ICE drinks & Hippeas who donated refreshments for the tournament. Homeless Rugby CIC aims to provide new opportunities to homeless people and improve their quality of life. Homeless Rugby believes that offering opportunities to regularly train and play rugby can inspire and empower individuals to realise their full potential, directly improving participants’ health, discipline, communication skills and self-respect. Homeless Rugby builds partnerships between rugby clubs and local homeless charities to help create positive sporting opportunities. The charity has found that participation in grassroots rugby can be a catalyst for people experiencing homelessness to engage more effectively with wider support services related to health, education, training and employment. Homeless Rugby aims to enable some of the most vulnerable people in England to transform their lives, and hopes to build towards a future society free from homelessness.